Milk Making Cookies You Can Eat for Breakfast! Hi! Glad you found me! These cookies have been a big hit on Pinterest. Over the years I’ve improved this recipe and now they’re even better. 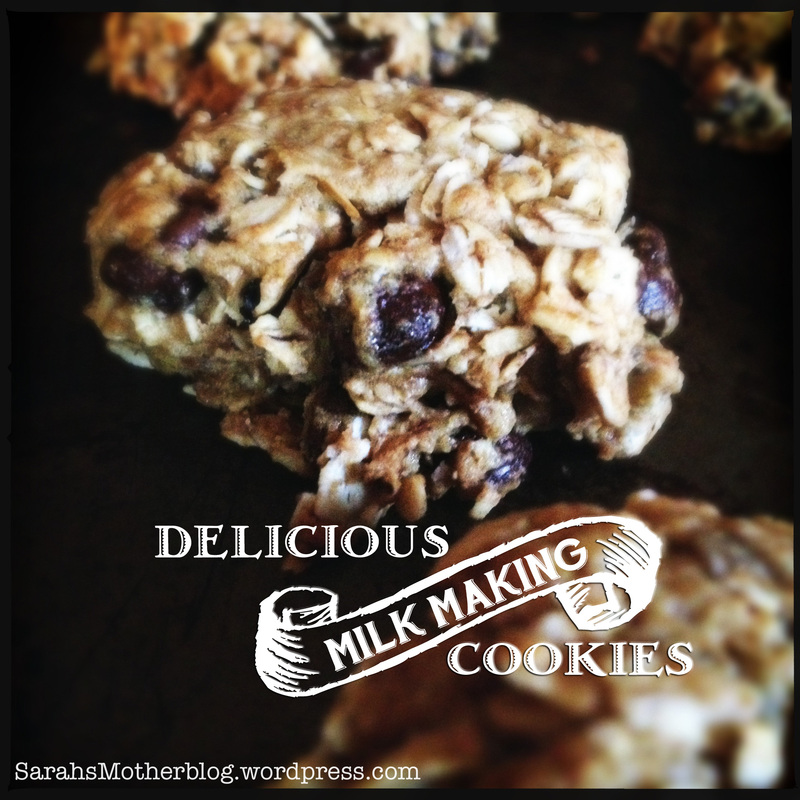 Check out the new and improved milk making cookie recipe here. Since I’ve headed back to work and since I’m breastfeeding Marlowe I’ve had to pump so I have a good supply for when I’m at work. 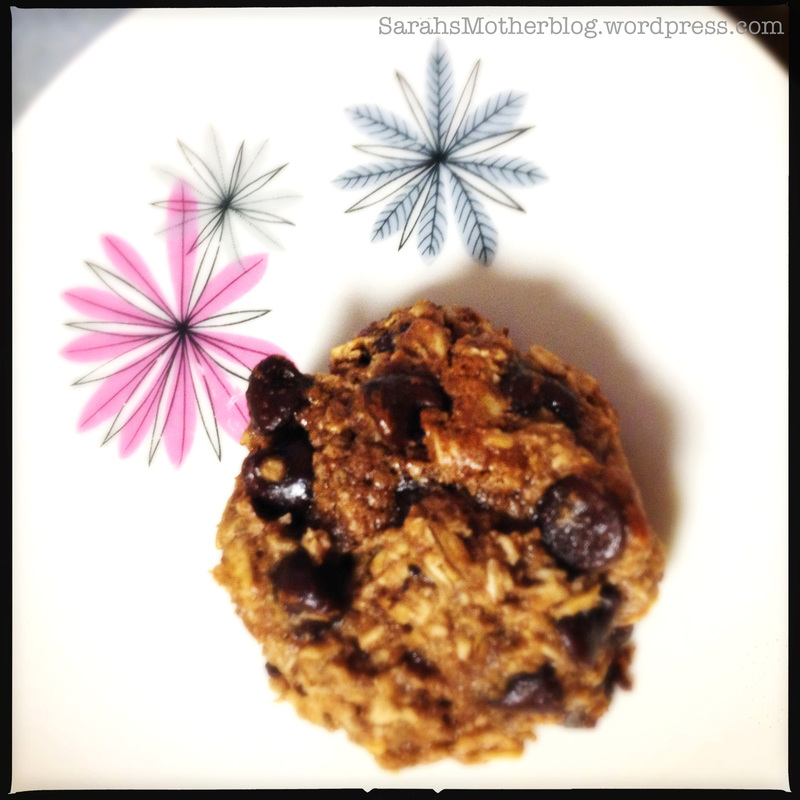 While trying to build up my frozen milk stash, I came across this recipe for Lactation Cookies; I thought I’d give them a try. First and foremost, they seem to help. Marlowe is not a small baby, at only 2 months he drinks about 6 ounces at a time and eating the cookies has helped me be able to feed him and pump a little extra on top of that on my days off. Secondly, there are a number of other benefits to these cookies which I’ll get into in a minute. Third, they are good…. and if you use all the sugar the original recipe calls for they are REALLY good. Lastly, they are very very easy to tweak to fit a dairy free diet (as dairy sensitivities are not uncommon in babies), vegan and or gluten free diet. The main milk-making ingredients are oats, flax and brewer’s yeast. Most people are familiar with the first two. Oats are a good source of iron, which can help with anemia which can inhibit your milk supply. Flax is high in fiber as well as important Omega-3’s- brain food for you and baby. But what is brewer’s yeast? Brewer’s yeast is left over from brewing beer, which accounts for its slightly bitter taste. In addition to be a lactogenic (fancy word meaning milk maker) food, it is chalk full of helpful vitamins and minerals, both good for your brain (B6 –increases nurotransmitter activity) and your body (B9, or folic acid, lowers risk of heart disease and stroke in addition to preventing birth defects). I picked up mine at a both Vitamin Shoppe and GNC carry brewers yeast. You may also find that they are carried in health food shops. Is it the same as “Nutritional Yeast”? I did a little googling on this… although brewer’s yeast is nutritional, its not “nutritional yeast”. Nutritional yeast is also a great source of B vitamins but it does not contain cromium (conversely, brewers yeast does not contain B-12). There is also a taste difference, Brewer’s Yeast is darker in color has a bitter taste while Nutritional Yeast is lighter in color and has a tangy, almost cheesy taste. While Nutritional Yeast is a great supplement (particularly for vegetarians) it’s also not known to be a lactogenic and it would taste funny in your cookies. So, there you have it, Brewer’s Yeast it is. The website suggested a few variations on the recipe… one of which being coconut oil for butter. Coconut oil, like butter, is high in saturated fat, and though that doesn’t exactly make it a “low fat” food the saturated fat aids in the processing of the Omega 3 in the flax (yay for working together) aid in he absorption of fat-soluble vitamins as well as increasing good cholesterol… it’s also pretty great for your cuticles so mix this dough by hand! So then I thought… how vitamin-packed can I make this cookie? 1 cup butter or margarine I used 1 cup of coconut oil instead, scooped from the jar, not melted. 2 tablespoons flaxseed meal (can be found at any local health food store) Mine happened to also contain chia seeds (more omega3s), if this is the case be aware you are going to have to add more water as chia seeds have a thickening effect. 2 large eggs Flax meal is a great egg replacer so make this vegan (and add more flax) by adding 1tbsp of flax meal and 3 tbsp of water for each egg (so total you’ll need 4 tbsp of flax and 1/2cup and 2tbsp of water). 2 cups flour go gluten free with a substitute like Bob’s Red Mill gluten free flour. 2-4 tablespoons of brewers yeast (be generous) The more the better, I used 4 heaping tablespoons. I also threw in a giant scoop of whey protein power (chocolate) on my last batch. Getting 3 kids dressed and out the door as well as myself to work 2 of these end up being my breakfast, the protein helps it stick with me. 3) Stir flaxseed mixture and add with vanilla to the margarine mix. Beat until blended. 4) Sift together dry ingredients (salt, flour, baking soda, protein powder if you went there), except oats and chips. 5) Add to margarine (coconut oil) mixture. Stir in oats then chips. 6) Scoop or drop onto baking sheet, preferably lined with parchment. Because the dough is a little crumbly, it might be easier if you use a scoop. –Don’t be afraid to add more water I find throwing in the chia seeds and the protein powder means I needed a bit more water. Just eye ball it… you can do it. Suped-up cookies rich in omega-3s, milk-making ingredients, fiber, brain boosting vitamins, antioxidants, protein, fat to help you absorb it all and sugar to make it delicious. Share the healthy goodness with your family or hog them all yourself (I won’t judge). Any variations you recommend? I’d love to hear your recipes!